Available in options for all sorts of budgets! for best results. With option for ongoing monthly sessions. This is one session, which can be very helpful and introduce you to some basic information. Though it is just one session, it should help you to begin to think about your ability to craft and create the life you dream of. It, of course, features much less instruction and support than ongoing work it's only a brief introduction. But hey, but it's a start! Not required to buy any texts or materials, unless you desire to. Affordable home study books, CDs, cassettes and videos. An Introduction to Individual, Weekly and Monthly Life-coaching Sessions to Achieve Clarity and Transformation in your life! So why life-coaching, you may be asking yourself? Well, it's very simple. People take lessons to play musical instruments, right? Or, they take lessons to learn to draw or paint. People would like to take lessons to learn all sorts of useful, enjoyable and fulfilling things, though often put off embarking upon these lessons because they believe they are "too busy." How you can quickly & easily manifest love, happiness & abundance for yourself and for your world! A wonderful book filled with strategies to help you achive the changes and enhancements in your life you have been dreaming of. 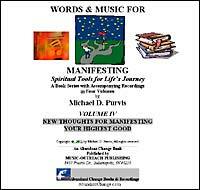 This uplifting and highly effective book helps the reader to craft the life you are dreaming of and introduces the reader/listener to many of the wonderful concepts found in the Words and Music for Manifesting Series (see below). A powerful and delightful four volume series which show the reader/listener very specific and highly effective spiritual and practical tools to help anyone craft and create the life they have been dreaming of! Change or enhance your life in any area: career, relationships, service, spirituality, etc. Try these amazing tools. They work! Michael D. Purvis, BME, is a graduate of Butler University and is the founder of three outreaches, a recording studio and a publishing company. A life-long student and seeker of truth, Mr. Purvis is an accomplished author, fine artist, recording artist, and teacher of many subjects to people of all ages, from childhood through elderhood. His artistic, instructional and entrepreneurial endeavors include: life-coaching, teaching private piano, voice and guitar, performing uplifting programs for the elderly, composing, recording, writing and illustrating. His wide and ever-evolving selection of books and recordings delight, uplift and instruct people of all ages, and feature his original self-help and musical instruction, fiction, poetry, musical renditions and compositions, and artwork. Michael's materials are available worldwide, through Music-Outreach Publishing and can be obtained via Music-Outreach.com, AbundantChange.com, and PlaySingNDream.com.